The possibilities of glastnost (or “openness”) were first seized [in Lithuania] by intellectuals: writers, artists, and scholars. The circulation of literary magazines exploded; many at first concentrated on the exposure of Stalinist atrocities, but then proceeded to fundamental critiques of the socialist system. 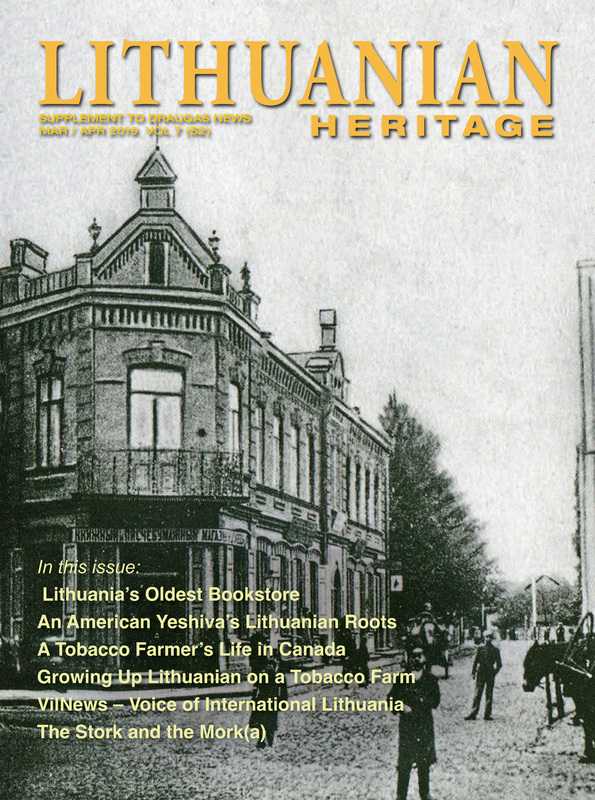 The first expressions of openness in Lithuania were tinged with nationalism, sometimes disguised under Soviet phraseology, such as “pluralistic socialism,” “national in form and socialist in content,” and so on. Concern for ecological matters and for the lamentable condition of the old town in Vilnius led a group of scholars and writers to establish in 1987 the Žemyna and the Talka environmental protection clubs. Beyond Vilnius, environmentalists raised concerns about pollution of the Baltic Sea, the poor quality of the food supply, and the dangers of the Ignalina nuclear power station. (A proposed expansion of Ignalina would have created the largest nuclear power station in the world with Chernobyl-type reactors.) As the ecological movement gained in scope and influence, its social criticism and concern for national identity became more explicit. Political dissent multiplied in early 1988. The Writer’s Union formally condemned the ecological policy of central authorities. A group of intellectuals petitioned the USSR Council of Ministers Chairman Nikolai Ryzhkov on the ecological threats to the Baltic Sea; nearly 5,000 Lithuanians signed it. The Artists’ Union held a turbulent conference as participants voiced their discontent with the subjugation of the arts to ideology; the union’s leadership was ousted. Heated discussions on history and political philosophy took place in the Žinija Society; debates centered on the deportations to Siberia, the role of the Catholic Church, the future of the Lithuanian language, and the concept of civil society. By Spring 1988 the main intellectual centers of the nascent opposition had already formed. At the Academy of Sciences, a group of scholars began drafting a new constitution while economists began to outline plans for the economic sovereignty of the Republic. The need for a coordinating center of the reformist activities was acutely felt. 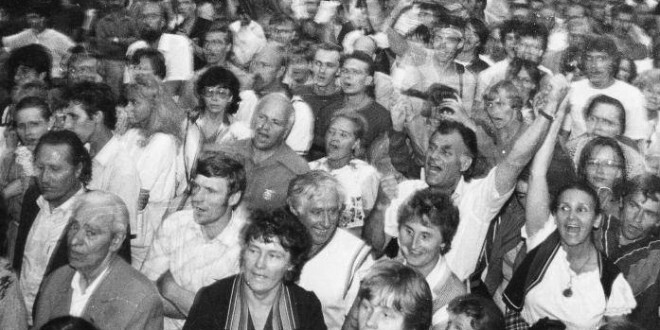 At a gathering in the Academy of Sciences on June 3, 1988, some 500 people elected a 36-person coordinating group of the Lithuanian Reform Movement, known as “Sąjūdis” (meaning “co-movement” in Lithuanian). The group consisted of writers, artists, journalists, scholars, architects, musicians and philosophers. Notably, no professional politicians or renowned dissidents were among them. Rather, the group was comprised of former loyal citizens, 17 among them members of the Lithuanian Communist Party (LCP). Under the guiding slogan “openness, democracy, and sovereignty,” the coordinating group established separate commissions to examine sociopolitical, economic, national, legal, ecological and organizational issues. The group had no permanent chairman, one was elected for each session. 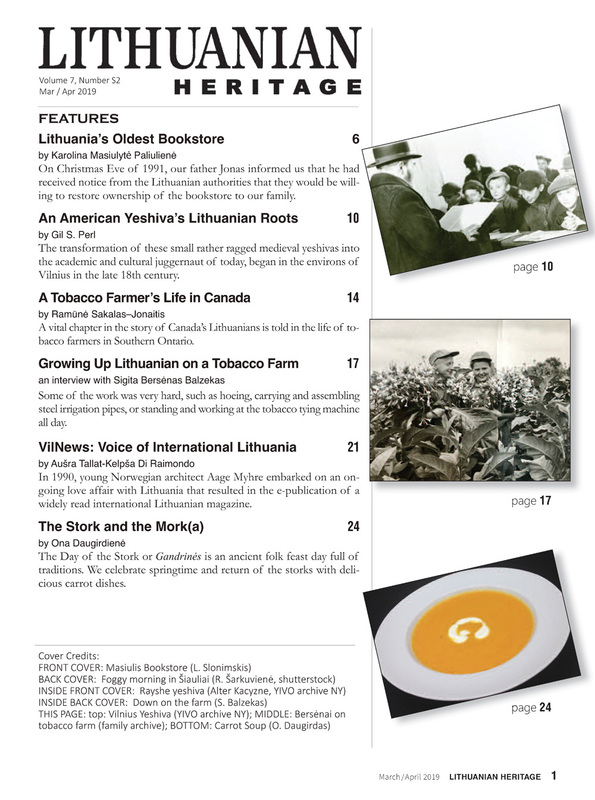 On June 13, the first unofficial newsletter of Sąjūdis, Sąjūdžio žinios, was published. Sąjūdis began its activities with no funds, no rooms, nor any means of communication with the public, but within three months it would become an alternative power structure. On June 14, 1988, Sąjūdis convened a small, closeddoor commemoration for the victims of Soviet deportations. On the same day the Lithuanian Freedom League, not bothering to secure official permission, organized a public meeting at Cathedral Square in Vilnius. Here, for the first time at a public gathering in postwar Lithuania, the national flag was displayed. On June 21, a small demonstration (500 people) at the entrance to the Lithuanian Supreme Council protested the demolition of historical monuments in the town of Trakai. Three days later the first mass meeting, organized by Sąjūdis, took place in Vilnius on the historic square of Gediminas. Some 20,000 people attended. The ability to organize a gathering of this scale without media access revealed Sąjūdis’ great organizational potential. People were invited to the rally simply by messengers and hand-written announcements posted on city walls. The rally was addressed by two men who were to become Lithuania’s leading figures: Vytautas Landsbergis (a member of the Sąjūdis coordination group, professor of music, and noncommunist), and Algirdas Brazauskas (member of the Central Committee of the Lithuanian Communist Party). 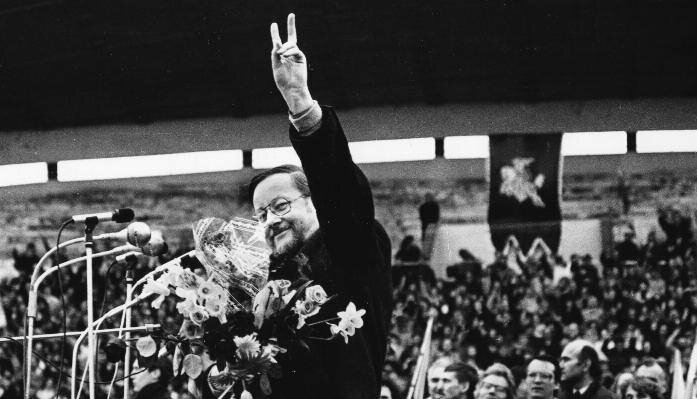 In his speech Landsbergis reassured the people that the goals of perestroika were “also the goals of Sąjūdis,” and expressed approval of Gorbachev’s proposal of “restoring the union republics’ economic, cultural and political sovereignty.” Brazauskas, in showing his solidarity with the goals of Sąjūdis, started a new political career as a reformer and populist. The Nineteenth Party Conference in Moscow, which concluded with a firm commitment to perestroika, strengthened Gorbachev’s position and opened wider opportunities for democratic change in the Soviet Union. On July 9, Sąjūdis arranged a “welcome back” rally to increase public pressure and accountability on the Lithuanian Conference delegates. The rally in Vingis Park in Vilnius was attended by more than 100,000 people. National flags, though officially still not recognized, fluttered throughout the crowd. The national anthem was sung by thousands for the first time since the end of the war. Of particular importance for the growth of Sąjūdis’ authority was the rally of August 23, 1988 (the 49th anniversary of the Molotov-Ribbentrop Pact). The Soviets had claimed that in 1940, as a result of a “socialist revolution,” Lithuania voluntarily joined the Soviet Union. The secret protocols of the pact, however, left it beyond doubt that Lithuania, as well as Latvia and Estonia, were forcibly annexed. On August 21 Sąjūdžio žinios published the secret protocols while Literatūra ir Menas [a literary magazine: Literature and Art] published the entire text of the pact. This was the first time the text of the protocols was published openly in the USSR. (The protocols had been printed underground in 1972). By merging with Sąjūdis, the Green movement—which had been active before the formation of Sąjūdis—also gained in strength. In September 1988 some 15,000 people in Estonia, 50,000 in Latvia, and more than 100,000 in Lithuania came together to form hand-in-hand chains to embrace the Baltic Sea as a symbolic gesture of protection from catastrophic pollution. On September 16-18, Sąjūdis led a protest action, called “The Ring of Life,” at the Ignalina nuclear station. More than 15,000 people encircled the station, demanding the suspension of construction of a new reactor (construction continued despite Brazauskas’ July announcement of a halt) and a safety examination of units in operation. On September 17 the first legally published newspaper of Sąjūdis, “Atgimimas,” appeared, signaling an upsurge in independent publications. Soon nearly 150 independent periodicals were in circulation. On September 19, 1988, the coordinating group of Sąjūdis appeared for the first time on national television. The movement was winning over the whole country and was strong enough for more radical action. The first prominent conflict between Sąjūdis and the authorities occurred at the end of September 1988. The conflict was triggered by the militia’s use of force against a peaceful demonstration by the Lithuanian Freedom League. Though the meeting was not officially permitted, some 15,000– 20,000 people attended. Making full use of rubber batons the militia dispersed the crowd. The next day Sąjūdis lodged official protests and called for a rally on Gediminas Square. For the first time Sąjūdis held a rally together with the more radical Freedom League. Landsbergis urged the crowd to keep calm and to resist provocations. An avalanche of protest letters and declarations flooded the Supreme Council and the Council of Ministers. Sąjūdis was imbued with a victorious spirit when it convened its first congress October 22– 24, 1988. Within the short period of five months since its founding the ideas of Sąjūdis were supported throughout Lithuania. It controlled an independent press network and had access to national television. The problems and conflicts that would later demand unflinching solidarity, commitment, and inventiveness were still beyond the horizon. The program adopted at the congress still acknowledged the movement’s ties with perestroika: Sąjūdis “as a spontaneous social movement … supports and extends the democratic and humanist reforms of the socialist society initiated by the Communist Party of the Soviet Union.” Nevertheless, the program contained statements that went beyond the confines of perestroika: “Sąjūdis holds illegal the Molotov-Ribbentrop Pact of 1939, it’s supplementary protocols, and its consequences for Lithuanian sovereignty… The main goals of Sąjūdis are openness, democracy, and the rule of law, as well as political, economic, and cultural sovereignty of the Lithuanian Soviet Socialist Republic.” As the quotation shows, while the program of Sąjūdis was definite as concerned the political sovereignty of Lithuania, it was far less certain concerning radical social change. The congress elected a Seimas (meaning diet, the term used in Lithuania as far back as the fifteenth century) as the movement’s representative body, consisting of 220 members. The Seimas then elected a 35 person Executive Council (Taryba). The only woman on the council was an economist, Kazimiera Prunskiene. The Sąjūdis congress had created an alternative power structure to the official authorities, a structure that was grounded in the people’s moral support, not on a repressive apparatus. The main events, however, were still ahead. As a growing political force, Sąjūdis pursued three main goals: (1) exerting moral pressure on the executive and the legislature, (2) winning elections to the parliament, and (3) winning international recognition of Lithuania’s forcible annexation in 1940. With legislative power, Sąjūdis could utilize provisions of the Soviet constitution to further its program. The Soviet constitution formally granted that a “union republic is a sovereign Soviet socialist state” (clause 76), that it had “the right of free secession from the Soviet Union” (clause 72), and had “the right to establish relations with foreign nations, to enter into international agreements, to exchange diplomatic and consular representation, and to take part in the activities of international organizations” (clause 80). In December 1988 Christmas was freely celebrated in Lithuania for the first time since the war. On Christmas Eve people were asked to turn off their lights for half an hour and to put candles in their windows as a symbolic referendum for Lithuanian independence. It was a truly impressive sight: in a moment the drone of electric lights in the cities was replaced by the twinkling of thousands of candles. Human solidarity seemed almost tangible. New Year’s Eve was marked by a mass boycott of dairy products due to their poor quality. The action, organized by the Greens and Sąjūdis, was directed against the state monopoly Agropromas (an agricultural products’ trust). The consumption of dairy products fell by 30%.While the boycott achieved some of its goals (the quality of dairy products improved, at least for some time), its real significance lay in revealing the vast potential of forms of noncooperation. In spring 1989, car owners refused to comply with a tax increase on private automobiles. An automobile picket line surrounded the Lithuanian Supreme Council. The increase was repealed in several months’ time. When the secret protocols of the Molotov-Ribbentrop Pact were published openly in the Lithuanian press, there remained little doubt about the illegal nature of the 1940 Soviet occupation. In July, 1989, a Baltic-wide petition campaign was started. The petition, addressed to the governments of the Soviet Union, West Germany (FRG), and East Germany (GDR), read: “We demand that the governments of the USSR, FRG, and GDR proclaim the secret protocols of the Molotov-Ribbentrop Pact invalid as of the date of their signing. We demand that the Soviet Union eliminate the consequences of the Molotov-Ribbentrop Pact, withdraw its occupying army from the Baltic states and permit the nations of these states to determine their political and economic system in Lithuania, Latvia, and Estonia themselves.” Over 1.5 million signatures were collected in Lithuania alone. Sąjūdis of Lithuania and the Popular Fronts of Latvia and Estonia marked the 50th anniversary of the signing of the pact by a huge event called “The Baltic Way.” On August 23, 1989, two million people in Lithuania, Latvia, and Estonia joined hands in a continuous 650 kilometer chain linking the capitals Vilnius, Riga, and Tallinn to protest the Soviet occupation and to demonstrate Baltic solidarity. The Baltic petition had marked influence. A commission of the Lithuanian Supreme Council officially recognized the existence of the protocols in August 1989. At the second meeting of the Congress of People’s Deputies of the USSR in December 1989, a special commission of the USSR Supreme Soviet declared the pact illegal. The year 1989 can be called the year of symbolic independence: nearly all public organizations, unions, and societies declared their separation from Moscow and established or reestablished their independence from Communist party controlled structures. The reestablishment of organizations that existed in independent Lithuania, such as Valstiečių sčjunga (a farmers union), the Scouts, the Ateitis Federation (Catholic Youth Association), and the Catholic women’s association Caritas, contributed to the revitalization of national consciousness. Prewar political parties were reestablished. such as the Social Democrats and the Christian Democrats, while others were newly created, such as the Labor Union and Independence Union. Sąjūdis was officially recognized as a social organization. An intricate network of groups closely related to Sąjūdis emerged. With this explosion of independent social, economic, political, cultural, and national organizations, it was no coincidence that the Supreme Council of Lithuania was the first in the Soviet Union to discard the constitutional provision mandating the “leading role of the Communist Party” and was the first to legalize the multiparty system. The Declaration of Independence On February 24, 1990, Sąjūdis won a landslide victory in the elections to the Supreme Council of Lithuania: they took 99 seats, as compared to 25 for the independent LCP, seven for the pro-Moscow CPL/CPSU, and five for independent deputies. Vytautas Landsbergis was elected chairman and Kazimiera Prunskiene was named prime minister. One of her deputy ministers was the leader of the independent LCP, Algirdas Brazauskas. The Supreme Council of the Republic of Lithuania, expressing the will of the nation, decrees and solemnly proclaims that the execution of the sovereign powers of the State of Lithuania, abolished by foreign forces in 1940, is reestablished, and henceforth Lithuania is again an independent state. One of the first goals of the new government was to secure international recognition for independent Lithuania. The deputies had hoped that Western governments – which in the past had repeatedly denounced Lithuania’s annexation – would immediately recognize the undoing of one of the consequences of the Molotov-Ribbentrop Pact. The government expected that the Soviet Union would have to yield to international pressure and “let loose” Lithuania, as well as Latvia and Estonia. The government’s expectations were premature. Only after 18 months of dedicated and bitter struggle of the Lithuanian people were they to be realized. This struggle is undoubtedly one of brightest pages in the history of nonviolent action. Independence Buttressed: the Battle of Laws. In addition to the declaration of independence, the government proclaimed that the Soviet law on mandatory military service would no longer be binding in Lithuania. The documents, together with a proposal for talks on all issues related to the reestablishment of an independent Lithuania (including the stationing of Soviet troops), were sent to Gorbachev on March 12. The Lithuanian actions coincided with the Extraordinary Third USSR Congress of the People’s Deputies, convened in order to adopt a restrictive law on secession and to grant extraordinary powers to the president. On March 15 the session resolved that until the secession law was adopted, decrees of the Lithuanian government would have no “legal validity” and that “state governmental and executive organs of the Lithuanian SSR [should] take all measures to ensure that law and order on the territory of the [Lithuanian Soviet Socialist] Republic be maintained.” In his letter to the session Landsbergis stressed that while resolutions of a foreign power had no legal force in Lithuania, any legitimate interest of the USSR could be the subject of talks. Both sides were convinced of the legitimacy of their positions, with the essential difference that the Lithuanian government had the people’s support while Gorbachev had to rely mainly on force. 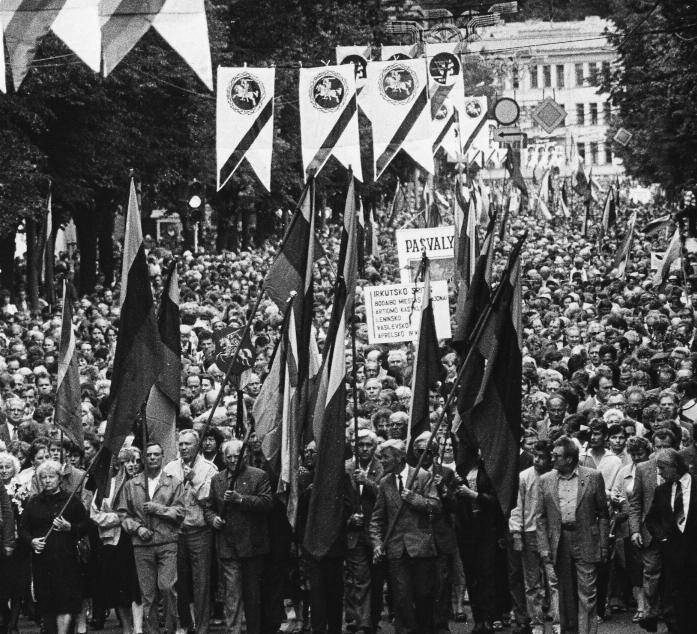 “Freedom for Lithuania” – chants at a Sąjūdis rally, 1989. Under these circumstances, a twofold strategy was adopted by Lithuania: first, to prove to the world that it was not Moscow but rather the Lithuanian government which had control over the situation on Lithuania’s territory; and second, to maximally exploit the growing disintegration tendencies in the USSR and the political struggle between Gorbachev and Yeltsin. The first battle line was over Soviet conscription. The Lithuanian government suspended the activity of Soviet conscription centers by cutting their finances. The Supreme Council, in “The Appeal to Lithuanian Youth,” stated: “The Supreme Council has repudiated your duty of serving in the armed forces of the USSR. … Lithuanian courts would not prosecute those who evade the conscription to a foreign army.” Lithuanian physicians refused to work for the conscription centers (forcing the Soviet military to import doctors from Belarus and Russia). Lithuanians serving in the Soviet military outside of Lithuania continued to desert (more than 1000 in 1990). On March 27 Soviet paratroopers invaded and attacked the havens for Lithuanian deserters, such as the Naujoji Vilnia Psychiatric Hospital in Vilnius and the Ziegzdriu Psychiatric Hospital in Kaunas. They broke down doors, cut telephone lines used for emergency communications, tore down the flag of the Red Cross, abused nurses and doctors, and brutally beat and abducted defenseless young Lithuanians and several sick psychiatric patients. The deserters were also attacked in their homes. State borders formed the second battle line. The Lithuanian government’s decision to begin preliminary border delimitation and controls was countered by Moscow’s order to its border troops to “block the way for illegal actions that violate USSR law on state borders.” Soviet troops strengthened their positions on the borders and began confiscating all firearms from Lithuanians (including hunting rifles). The third line of battle developed over the control of buildings and institutions. In the weeks after the declaration of independence, Soviet paratroopers occupied several buildings that had earlier belonged to the Communist party. Even though no country officially recognized Lithuania’s independence at first, the March 11 declaration had wide international repercussions. The first to congratulate the Lithuanian people with a “return to the family of free nations” were the deputies of Poland’s parliament. Lane Kirkland, president of the AFL–CIO, sent a letter of congratulations in the name of 14 million Americans. Congratulations were extended by the Popular Front of Estonia. In Kishinev (Moldava) several thousand people held a demonstration of solidarity with Lithuania. US President George Bush stated on March 23 that his country supported Lithuania’s right to self-determination: “We have repeatedly urged the Soviet Union—Soviet government— to enter into immediate negotiations with the Lithuanian government, which has itself called for those talks.” President Vaclav Havel of Czechoslovakia called for a political dialogue between Lithuania and the USSR and offered his good offices for the negotiations. The European Parliament in Strasbourg, though withholding full recognition, addressed the USSR and Lithuania as two different states that had to resolve their disagreements by constructive dialogue. The Law on Certification Cards— Lithuania’s first step to bypass the USSR passport control system—adopted on April 5 caused Moscow to lose its patience. On April 17 Gorbachev and Ryzhkov (chairman of the USSR Council of Ministers) sent a forceful telegram to the Lithuanian Supreme Council: “If within two days the Supreme Council and the Council of Ministers of the Lithuanian SSR do not revoke their aforementioned decisions, orders will be given to suspend delivery of the type of production that is sold on the foreign market for hard currency to the Lithuanian SSR from other Soviet republics.” That meant, above all, oil and natural gas (over 90% of Lithuanian energy resources were supplied by other Soviet republics). The ultimatum was answered by another Lithuanian proposal to start bilateral talks. On April 25 Moscow cut off gas and oil supplies to Lithuania. The Lithuanian government announced the creation of the Department of National Defense. The blockade continued for 10 weeks. Lithuania’s main industrial enterprises stopped, transportation slowed down, television and radio transmissions became shorter, some food products became scarce. Nevertheless, the blockade did not achieve its main goal—to force the Supreme Council to revoke the March 11 independence declaration. From the start the government and the population showed great inventiveness. A Blockade Committee was established, headed by Deputy Prime Minister Brazauskas. A public fund was created for donations (which received donations both from private persons and organizations in Lithuania and from those abroad, such as the World Lithuanian Community and the Supreme Committee for the Liberation of Lithuania). Anti-blockade headquarters were created in all major cities in order to distribute scarce resources, resolve emerging problems, and assist people most hurt by the blockade (such as the workers of shutdown industries). Of equal importance was private initiative: energy resources were clandestinely imported from Belarus, Ukraine, and Russia (ingenious Lithuanians even managed to purchase oil and gasoline from Soviet troops stationed in Lithuania). Paradoxically, the severing of centrally allocated energy resources opened the way for a more free market economy, though the opportunity was not fully exploited. Public organizations in various countries reacted strongly to the economic blockade. Support demonstrations were regularly held in Sweden. In the Soviet Union analogous rallies were frequent, while contacts between Lithuanians and leaders of democratic movements in other Soviet republics continued to widen. Letters and telegrams in support of Lithuania’s independence were sent from different parts of the USSR. During the blockade people in Moscow brought food to the Lithuanian mission there. As the blockade took full effect, French President Francois Mitterand and West German Chancellor Helmut Kohl urged Lithuanian leader Landsbergis to consider “a temporary suspension of the effects of the Lithuanian March 11 declaration of independence to get negotiations with Moscow started.” The letter prodded Lithuania’s Supreme Council to call a 100-day moratorium (beginning June 29, 1990) on the enactment of the independence declaration as a compromise step. Soviet oil shipments resumed immediately. Negotiations, however, did not materialize for another two months. 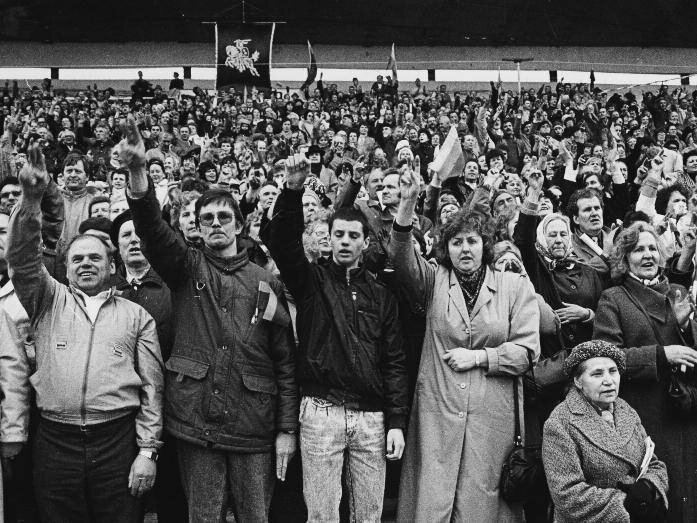 The remainder of 1990 witnessed increasing intimidation by Soviet leaders: they threatened to destroy the Lithuanian economy, to set groups of the population against one another, to incorporate parts of Lithuanian territory into the Russian SSR. The Lithuanian Supreme Council, in turn, consistently proposed bilateral talks while it continued to build the institutions of an independent state. The situation could not have lasted indefinitely without undermining Moscow’s credibility—Moscow had to figure a way to bring Lithuania back into submission. In September 1990 the Politburo of the Central Committee of the CPSU issued an “Address to Communists and to the People of Lithuania” that urged them “to put a stop to intentional continuation of old wrongs, distortion of the past, and to make the right choice at this complicated stage of historical development.” In October 1990 officials of the USSR refused to guarantee the implementation of agreements on the sale of material resources and goods to Lithuania. The USSR stepped up its terror campaign against young men who refused to serve in the Soviet military. The Soviets also encouraged dissension among non-Lithuanians, many of whom were dissatisfied with deteriorating living conditions. In order to use mass force to crush Lithuanian independence, the Soviets would have to appear “justified” in the eyes of public opinion, both at home and abroad. Vociferous campaigns against the Lithuanian Supreme Council and S¹judis leaders were launched in the Soviet media. Obvious fabrications were employed. For example, Soviet television broadcast patently fake instructions of the Lithuanian Defense Department purportedly outlining plans for the imprisonment or deportation of supporters of the pro-Soviet Communist party. A decision by the Lithuanian government gave Moscow an opening to attempt a coup. On January 7, 1991, Prime Minister Prunskiene, citing the staggering cost of state subsidies due to inflation, decided to raise the prices of chief foodstuffs by 320%. The next day members of Edinstvo [a pro-Soviet reactionary group] organized a protest rally at the Supreme Council. The crowd pushed through lines of parliamentary guards and attempted to invade the building. In face of these actions and widespread discontent, the Supreme Council had to revoke the price increases, and Prunskiene and her cabinet were forced to resign. On January 11 a shadowy new “authority” announced its existence: the National Salvation Committee (NSC). Members of the reactionary groups and the Soviet military constituted its core. The NSC claimed to “take full responsibility for the fate of the republic.” Soviet troops invaded and occupied the offices of the Lithuanian Department of National Defense in Vilnius, Alytus, and Šiauliai. The press center in Vilnius was attacked and occupied. In the onslaught seven people from the crowd that was guarding the building (without weapons) were wounded, four of them from rifle fire. On the same day the press center was occupied, journalists from thirteen separate periodicals published a joint independent newspaper, Laisvoji Lietuva (Free Lithuania). On the evening of January 11 a task force of KGB paratroopers, Alfa, arrived in Vilnius. Around midnight on January 12–13, representatives of the NSC demanded the Supreme Council’s resignation and “announced” the introduction of direct USSR presidential rule. On January 13, at 2 a.m., paratroopers in armored vehicles advanced on the radio and TV center and the television transmission tower in Vilnius. People had formed human barricades to protect the structures. In the attack on the tower 13 civilians and a KGB officer were killed and 702 people were wounded. Loudspeakers from the tanks and armored personnel carriers announced that the NSC had taken political power, that a curfew was to be introduced at 6:30 a.m., and that the chief of the Vilnius military garrison, Major-General Uskhopchik, had been appointed military commandant of Vilnius. On January 8, as Soviet intentions of a coup became evident, Vytautas Landsbergis made a radio appeal: “Come and help your own government, otherwise a foreign one would overcome us.”Richard Attenborough’s movie Gandhi was shown on national television. From January 8 on, a round-the-clock civilian watch began at the Supreme Council building and in the next days around other strategic facilities such as the TV transmission tower. In an orderly manner, according to a defined schedule, people came from all over Lithuania to keep watch. Citizens of Vilnius offered them food and room for rest. Unarmed policemen and undergraduates of the police academy joined the watch, with the task of preventing armed confrontations. On January 12, some 7,000–9,000 people gathered around the TV transmission tower, mostly young Lithuanians. The crowd sang, played music, and amused themselves deep into the night. When local radio brought news of tanks and other military vehicles on the move, people formed a human barrier around the tower. The tanks came forward, crushing cars, busses, and trucks that stood in their way. One woman and one man were crushed to death under the tank treads. Soviet soldiers beat Lithuanians in their path with rifle butts. As stated, the troops opened fire, killing fourteen people. We all thought that they would come next to the parliament. I was afraid, and so were others, but in general the mood was more angry. That was so even when people came from the TV tower and told us what had happened; some of my friends came and their faces were quite changed, stony. … Landsbergis broadcast over the loudspeakers, asking us to move to the side, so as not to be caught in the crossfire when the parliament was attacked. He said something like ‘we need live witnesses, not more victims’; but we didn’t move. Thousands thronged around the building. Heavy machinery from a nearby construction site was used to erect tank barriers. People sang and prayed. The Catholic priest Robertas Grigas conferred absolution on all present. Inside, servicemen of the defense department, armed mostly with sticks and old hunting rifles, erected defenses. The unarmed people on the square were determined to halt the attack on the Supreme Council at any cost. However, the attack never materialized. While we do not have access to secret cables that would outline Soviet decision making, clearly the dogged determination of the Lithuanian people was an important factor in deterring the continuation of this military assault. During the attack on the radio and television tower, live broadcasts of the atrocities continued until the Soviets wrested control. Because of clever camera layout, the whole of Lithuania—and consequently the whole world—could observe the details of the paratroopers’ attack. When the tower and radio stations were seized, the Supreme Council’s separate radio transmitter inside the parliament building went off the air too. Yet several hours later technicians managed to connect with the transmission aerial in Kaunas. Soon after 5 a.m. the latest news from the Supreme Council was back on the air. Citizens from Kaunas and neighboring localities gathered around the Sitkunai transmission center and the Kaunas radio station. An appeal to Soviet troops “Do not shoot at peaceful people!” was read over the radio. The protection of the Sitkunai aerial was vital to secure the flow of information to the country. Vytautas Landsbergis flashes a victory sign at Sajūdis rally. Soviet aggression finally moved Western leaders to view “Baltic independence as an international problem and not just an internal domestic affair of the Soviet Union.” Strong international protests ensued. On January 14 the prime ministers of Sweden, Iceland, Norway, Denmark, and Finland officially denounced the behavior of Soviet troops in Lithuania. NATO officials in Brussels warned that Moscow’s actions in Vilnius could spoil the good will between NATO and Moscow. The European Parliament demanded “that all recently allocated troops be immediately withdrawn from the Baltics.” Members of the European Community demanded “that the current actions of the Soviet Union towards Lithuania not be continued or carried over to the other Baltic states. Otherwise, they will have to react accordingly to this situation and break off relations with the Soviet Union.” On January 16 the foreign minister of Denmark, Elleman Jensen, offered refuge to the Lithuanian government in case it would have to operate in exile. Denmark also offered to shelter prospective refugees from the Baltics. A radical resolution was adopted by the Alting (parliament) of Iceland: “there is no more appropriate way to solve the problems of the Baltic states than to fully and unconditionally recognize their independence.” Indeed, Iceland was the first state to do so on February 11, 1991. The ability of the Lithuanian people to remain calm in a most complicated situation, to resist provocations of the foreign troops, to refrain from any acts of physical resistance so desired by the enemy played a decisive role in turning world public opinion in favor of Lithuania’s independence. The image of resolute, defiant, yet nonviolent civilians asserting their independence in the face of ruthless Soviet brutality further undermined the remaining hold of the Soviets on the Baltics. ?